1：We heard your carrot cake was chosen as "NAKANO IPPIN GRAND PRIX". How was the idea for this pastry born? Kyle Sexton : It was not an original idea. Carrot cake is very popular in America. 2：Who's your favorite pastry chef ? 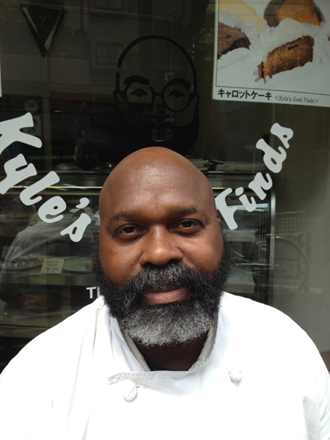 Kyle Sexton :I have no favorite pastry chef. 3：We heard that there is art you can eat. Is this true? Kyle Sexton :I think there is an art to enjoyment . 4：What is the favorite of all the pastry? 5: What beauty means for you? 6: What is the appeal of pastry for you? To make something from simple ingredients. 7：Why did you choose Kyle's Good Finds as your shop's name? 8:What do you like about this job? 9: How long have you been working at NAKANO? 10:Do you know any recommendations on where to visit at NAKANO? 11:What's your favorite past time in summer? 12：What kinds of birds do you like? 13:Please give us the message for Japanese fans. You can find a slice of America in my shop.